Before setting out with their flocks, they prepared a portable stock of food by slowly cooking cut up meats with onions and other flavourings until the liquids had been absorbed. The stew was then dried in the sun and packed into bags made of sheep’s stomachs. At mealtime, water was added to a portion of the meat to reconstitute it into a soup or stew. The paprika that is indispensable for flavouring the modern goulash was added to the formulation in the 18th century. 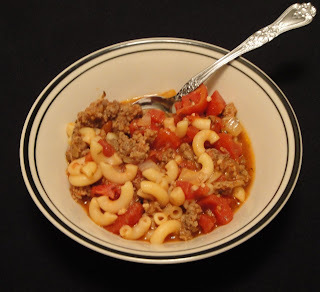 The classic “kettle goulash” is prepared by frying cubes of beef or mutton with onions in lard. Garlic, caraway seeds, tomatoes, green peppers, and potatoes complete the stew. Szekely Gulyas, another Hungarian specialty, is a stew of pork and sauerkraut flavoured with tomatoes, onions, caraway seeds, and sour cream. Wait until you taste this goulash, pure comfort. in a Dutch oven, cook the ground beef over medium high heat until no longer pink. Break up the meat while cooking. Spoon off grease. Add onions, salt, pepper and garlic, cook about 3 minutes. Stir well. Add remaining ingredients. Stir well. Cover and simmer for 30 minutes. Serve with garlic bread. Enjoy! Warming and hearty.A perfect winter food. Hi Christine, I'm going to make this for dinner tonight. I'll let you know how it turns out, I'm sure it will be good.